Author(s): Maria Grazia Refolo, Rosalba D'Alessandro, Catia Lippolis, Caterina Messa, Nicola Carella, Aldo Cavallini, Brian I. Carr. IRCCS “S. de Bellis”, Castellana Grotte (BA), Italy. Purpose: Platelet extracts can stimulate cell growth and contribute to tumor biology. It was recently shown that they stimulate the growth of hepatocellular carcinoma (HCC) cells and decrease apoptosis. Doxorubicin is a commonly used HCC chemotherapy that increases apoptosis. We therefore examined the effects of platelet lysates (hPL) on doxorubicin-mediated HCC cell growth inhibition and apoptosis induction. Methods: Three human HCC cell lines, PLC/PRF/5, Hep3B and HepG2 cells, were grown in culture and growth was measured by the MTT assay and apoptosis was measured using Muse Annexin V assay kit. Cells were also probed by Western blot. Results: hPL decreased doxorubicin-mediated growth inhibition and apoptosis induction in all three cell lines. When doxorubicin and hPL were added at separate time intervals, protection by hPL was also observed. WB showed that hPL caused prolonged and increased levels of phospho-JNK and phospho-p38. Furthermore, a p38 inhibitor abrogated the modulating effects of hPL on both growth and apoptosis, indicating its importance in mediating hPL actions. WBs also showed that hPL decreased doxorubicin-induced markers of apoptosis. 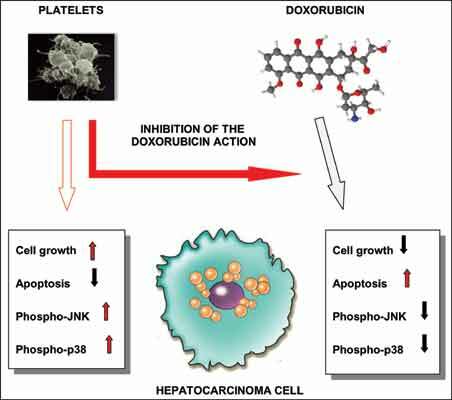 Conclusions: hPL modulate the actions of the cancer chemotherapeutic agent, doxorubicin. Platelets are part of the complex microenvironmental milieu and their effects may contribute to a modulation of chemotherapy actions. Conversely, drugs that alter platelet levels or degranulation could potentially augment doxorubicin actions on HCC cells. Keywords: Apoptosis, autophagy, cell growth, doxorubicin, HCC, platelets. Affiliation:IRCCS “S. de Bellis”, Castellana Grotte (BA), Italy. Keywords:Apoptosis, autophagy, cell growth, doxorubicin, HCC, platelets. Abstract:Purpose: Platelet extracts can stimulate cell growth and contribute to tumor biology. It was recently shown that they stimulate the growth of hepatocellular carcinoma (HCC) cells and decrease apoptosis. Doxorubicin is a commonly used HCC chemotherapy that increases apoptosis. We therefore examined the effects of platelet lysates (hPL) on doxorubicin-mediated HCC cell growth inhibition and apoptosis induction.